Heatstroke (hyperthermia) occurs more easily than most dog owners realise and it can be deadly unless your dog receives immediate veterinary treatment. Unfortunately, the most common causes of heatstroke are related to owner neglect, usually unintentional so read on to find out how you can protect your dog and what to do if it happens. The most common cause of heatstroke in dogs is when their owners leave them in cars while they ‘run in’ to a shop or meeting. 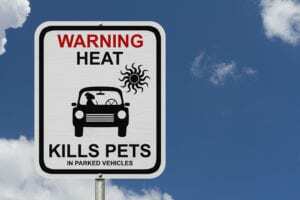 Even five minutes in a car in summer heat endangers your dog’s life as the car heats up far more quickly than you realise due to its metal body. Please never, ever leave your dog alone in a car on a hot day. 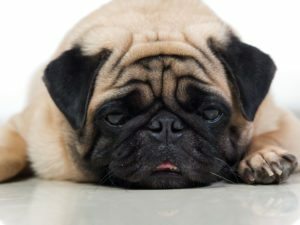 Heatstroke is especially common in ‘brachycephalic’ breeds (dogs with short muzzles e.g. like pugs, bulldogs and Pekingese). Other risk factors include obesity and obstruction of the airways. Initially your pet will appear distressed; they will pant excessively and become restless. As the situation becomes worse and the body temperature increases they may drool copious volumes of saliva and become unsteady on their feet. Your pet’s gums may become a bluish-purple or bright red colour. This is due to the inadequate oxygen supply to the tissues. Never leave your dog alone in a car on a hot day, even for five minutes. If you notice symptoms of heat stroke, gently allow cool water to flow over your pet. Use a hosepipe but keep the flow gentle, not strong. Get to the vet immediately as intensive care is generally needed to save your pet’s life. Cool your dog on the way to the vet by using a fan or air-conditioning to maintain airflow over the body. You can also use a spray bottle to lightly cool them with water. Do not not submerge your pet in ice or ice cold water, this can have detrimental effects to your pet’s recovery. Your dog will be assessed on arrival and a treatment plan initiated. The more severe the heatstroke, the more intensive care will be required. Intravenous fluids are needed in heat stroke cases: they cool the body, maintain blood pressure, support the kidney system and generally help speed recovery. Your pet’s airway will need to be maintained and excess saliva kept clear from the mouth at all times. Oxygen may be required. At times sedation is needed to allow safe, effective ventilation. Your veterinarian will closely monitor your pet, watching for changes in body temperature, blood tests and urine examinations to assess the extent of damage and their progression. 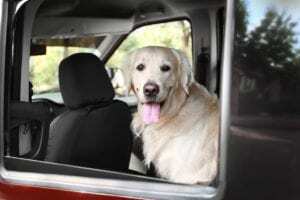 Never, ever leave your dog in a locked car on a hot day. Even if you open the windows it does little to slow the overheating process. Pets do not sweat; they evaporate heat by panting. Panting requires large amounts of air to move heat away from your pet and when the heat is trapped in the car, they can literally overheat and die within minutes. Ensure your dog has plenty of fresh, clean water at all times. If outside, place water in a shady area. Consider using frozen water bottles to keep it cool – or provide a number of water bowls in different areas. If your dog has a tendency to knock over his water bowl, anchor it down with a heavy stone placed in the water, or replace his bowl with one that is larger and heavier. Metal bowls with wide bottoms work well. 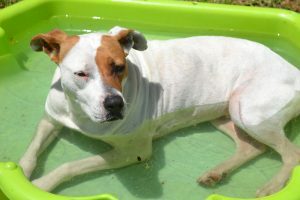 If your dog is a water lover purchase a children’s plastic pool and half fill it with water. This becomes an additional water bowl and they can also play, splash, dig, lie down and have loads of fun in it! Avoid exercising your dog during the hottest hours of the day and watch his feet! A hot pavement and hot tar will burn his pads. Humid days can often be just as bad or worse than very hot sunny days, so keep this in mind too. If your dog is outside, make sure he has shade from the sun at all times.